This is a passage about which very little has been written. Commentators seem to pass it by as something very mysterious. But if the Holy Spirit be with us we will find that there is a lesson for us in this part of the Word. ‘The rocks rent.’ Wherever we read of this taking place we know it is the presence of the Lord. This explains Jonathan’s wonderful victory — ‘there was trembling . . . and the earth quaked’ (1 Sam. 14: 15). At Philippi the earth shook (Acts 16: 26) –the Lord was present. ‘The saints which slept arose.’ When death is spoken of as sleep, it is generally in reference to God’s people. Daniel speaks of those that ‘sleep in the dust’ (12:2). Then we have it in John 11:11; I Cor.15: 6,51; Acts 7:60. It is as if the Lord did not wish us to think of death as anything sad or disagreeable. He wants us to think of it as a sleep or rest,–a blessed sleep without even dreams. Let us learn from this the connection between the graves opening and the Veil rending. The Veil separated between the Holy and Most Holy Places. It was a doorway or gateway representing Christ. ‘I am the Door.’ And when the Lord put down His hand and rent it from top to bottom, He opened the way for us to go in. He can come out, and we can go in. In this connection we shall see some special meaning in the graves opening. It was the death of Christ that opened them. 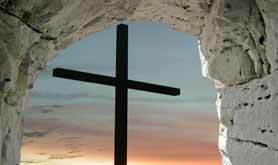 Your body is redeemed by Christ’s death as well as your soul, and it must come out of the grave. ‘After His resurrection.’ The graves were opened at His death, but the saints did not come out of their graves till Christ’s resurrection. It is like when Christ breathed on the disciples and said, ‘Receive ye the Holy Ghost,’ but they did not actually receive the Spirit until Pentecost. ‘Many bodies,’ –not merely one or two. I think it means a great company. What is the meaning of this? The graves stood open till the third day, and passers-by would be amazed to see the stones rolled away. You begin to see now this was a testimony to Christ in more ways than one. These are all saints, and they are coming out of their graves to honour the Holy One. Perhaps the reason Christ did this was to show a sample of His power. These saints were the first-fruits of the resurrection, and when He went up they would be His body-guard, nearer Him than the angels. If you ask, why does only Matthew mention this? The answer is, the Holy Ghost gave one part to one and another to another. Matthew says, ‘many of the saints which slept arose.’ Christ did what Daniel says will be done for all the saints. He took some of them and raised them up. In effect He was saying, ‘I am the Resurrection and the Life.’ These saints were likely those who had lately died, for they ‘went into the holy city and appeared to many.’ If they had been saints of an older time they would not have been known. Perhaps old Simeon was one of them, and Anna and Zacharias. When Christ appeared after His resurrection He conversed as well as appeared. These saints appeared and conversed with many. At first they would cause alarm, but that would soon be dissipated. It is not likely they spoke of the other world. Very likely they appeared as witnesses for Christ. From all this let us learn the connection between Christ’s resurrection and ours. Christ’s love to His own is so great that He will not lose even the dust of His people. He will fashion it all into beauty and comeliness. Where there was weakness He will put power, and where there was corruption He will put incorruption.